"Looking For Information On Denver Cancer Wigs And Wig Types?" If it is probable that you will suffer hair loss, ask your doctor for a prescription for a "hair prosthesis," or "cranial prosthesis." Wigs needed for medical purposes such as a side effect from cancer treatment. Once you are ready to buy a wig, it's good to understand a little about what your options are. Today, Hana Designs is a showcase for some of the finest wigs and hairpieces available anywhere in the world. 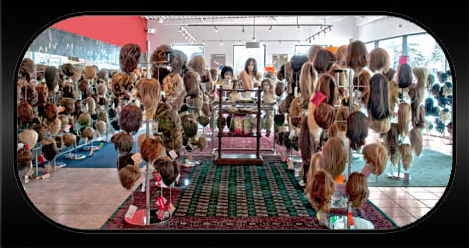 Human hair, synthetic, or blends of both, the selection is unlimited. Each piece is custom styled and fitted to accommodate even the most discerning of clients. The quality of a human hair wig over a synthetic wig cannot be overstated. Given the styling flexibility and superior quality of human hair wigs, ultimately price should not be your deciding factor. You should also consider the self-confidence that a more realistic wig will give you knowing that you can wear it like your natural hair and style it anyway you like without feeling conspicuous. Our wigs can be made in a wide array of colors ranging from light blonde to jet black. Our wigs can also be customized to match any hair type. Please ask as many questions as necessary during your consultation and be specific about your hair needs at the time of your order to ensure we customize your wig to truly match the hair style, texture and color that will make you feel comfortable. If you have ever considered trying a new color, consider this time your chance to be bold. Do you have straight hair and want to go curly? Or vice versa? What better way to tell the world you're fine than to try a dramatic new look whether in color, length or style. Our natural hair wigs give you the flexibility to experiment with a totally new look while still looking natural. All wigs require some daily care, but it is often less attention than you probably would normally spend on your own hair. Basic care instructions can be found on our website, extensive care instructions can be shipped with your wig. Certain side-effects of treatment, such as if you experience excessive sweating, can require extra care. You should check our website FAQs or contact us for a consultation if the answer to your question is not on our website.